Spray 4- to 5-quart slow cooker with cooking spray. In small cup, place 1/4 cup of the broth; dissolve flour in broth. Add all ingredients to slow cooker except rice. Cover; cook 3 1/2 to 4 hours on High heat setting. Remove bay leaves. Ask your butcher for an affordable beef stew meat. Slow cooker infuses flavor while cooking any meat cut deliciously. If using fresh marjoram or thyme leaves, 1/2 teaspoon dried leaves equals 1 1/2 teaspoons fresh leaves. If using a round 4 1/2-quart slow cooker, it might take 1 hour longer. The 5-quart oval will take the same time as step 3. Easy as 1, 2 ,3. 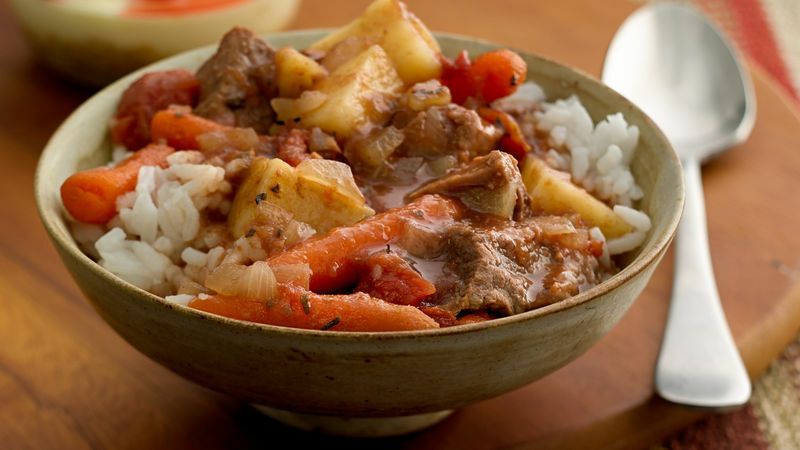 Place everything in slow cooker in the morning, and by the afternoon there will be a hit on the table: beef stew!